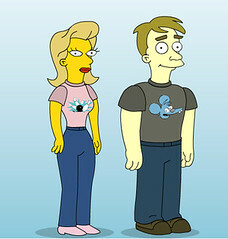 I spent a good chunk of time with Lori on Thursday night building avatars on the Simpson's Movie website. Unless I missed it in the UI, the site doesn't provide an ability to export your avatar as an image though it really should! (This image was taken from a screen capture and manipulated in MSPaint) I learned of the site and it's avatar abilities through the viral aspect at work: everyone was making them and posting them to facebook.